Running Away to St Ives to Be Alone via At Least Five People. Two weeks ago I contacted an old school friend who lives in St Ives. I have not see this friend since we were at school, which was in 1976, so you can imagine she may have longed to keep it that way. But no, this friend has offered me a restorative holiday many times before and this time I was determined that only my own violent death would prevent me from going. It was all meant to be; 15 year old son went effortlessly and happily to his cousins in London, 19 year old son did what 19 year old sons do (I don't know what they do) and the lodgers were given a peashooter each, told to repel all intruders and to put the bins out on Friday morning. I put on my best spotty dress and pink lipstick, and left. I ran away. Lunch en route with Felicity Warner, this means lots of what my brothers and I used to describe as Windmilling, going round and round and round, like a windmill, chatting. 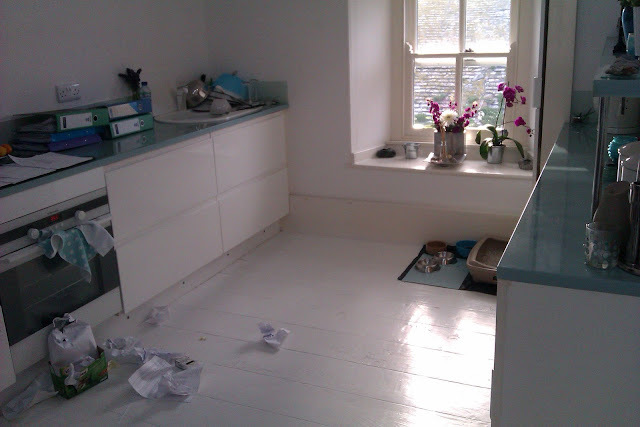 Three days with Jane in her St Ives cottage. I know for a fact that Jane talks a lot and so do I. On my way back from St Ives, lunch with Lizzie Hornby, who has written and performed the most beautiful music on this link- http://www.cdbaby.com/cd/elizabethhornby, and who is a teacher on this link - www.busymisslizzie.com. Someone with two websites does not sit in a corner silently watching the world go by. A night with my dear friend Fern, the witch, Soul Midwife and Reiki Master. Along with two others, the next day, I am going to do my Reiki 2, making a total of four of us, not including Fern's family. That is not about me seeking solitude. It is more like me seeking a party. First stop, then, lunch with Felicity www.soulmidwives.co.uk. A lovely sunny day, a cottage in Dorset and chats with a wonderful friend. Felicity has a huge job to do, she has trained hundreds of Soul Midwives and has started something large and powerful. It is hard to keep all that together, and so she is writing the definitive book on Soul Midwifery, a kind of bible/hand book answering and explaining all aspects of working with the dying. Felicity is including the spiritual side of Soul Midwifery in this book, which I think is terribly important. She has much experience working with this side of end of life care, and I am very interested to see how it is received. Feeling happy and restored by Felicity's company, I set off again for St Ives only stopping along the way for chocolate and crisps from petrol stations, arriving at last in St Ives at 8pm. Oh! The narrow streets. Oh! The masses of people on those narrow streets! My car could barely fit through the tiny passageways. Even driving at 5 miles an hour, with all the people milling around, I feared that I would arrive at Jane's front door with holiday makers plastered all over my windscreen, on my roof and wrapped around the bumper. Jane's cottage, here on the St Ives sea front, is so tasteful, so perfect, so clean and tidy that I knew I would be healed of all ills and discombobulations within minutes - and so I was. The cottage is painted white top to bottom, white wooden floors, white walls, white ceilings. Into this whiteness Jane has brought clean bright colours, beautiful objects, but more astonishingly, she has tastefully removed all clutter... there is no clutter, none, nothing, it is not possible you say, but I say, it is so. Maybe Jane has deep clutter warehouses beneath the floorboards, but I doubt it. My bed not only has a headboard painted as a bright blue summer sky with white clouds, it has a memory foam mattress too, and everything is here for my comfort. Oh I can get used to this, I may just call home and get them to send all my stuff and not go home at all. And Jane says things like, Shall I run you a bubble bath with candles and bring you some tea? My soul, it healeth but it stayeth quiet, in case she stops. Wonderful and tasteful kitchen - and, note the paper on the floor. Jane has been ploughing through her paper work at the computer, and has been chucking it over her shoulder onto the floor. I think this is clutter. 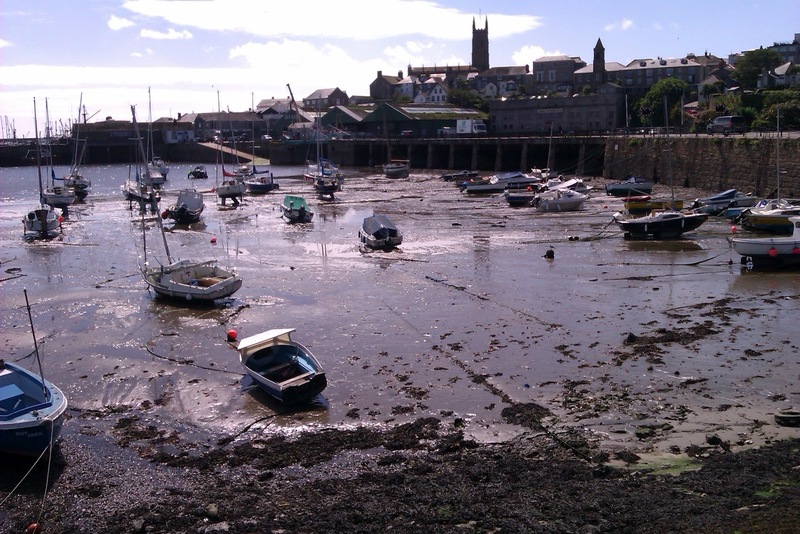 Lunch in Penzance today with Joy, was a joy. I ordered sweet pea fritters by mistake but got the correct sweet corn ones. Joy is a healer and a Soul Midwife who wants to bring A Graceful Death to Truro Cathedral. She has already spoken to the Cathedral about showing it there, with the attendant workshops, talks, discussions and presentations. I like this idea, though if we did go ahead, it would probably have to be in 2014. Joy is a trained bereavement counsellor and aromatherapist, she also uses Singing Bowls to treat people in need of healing. Being healed with Singing Bowls is a seriously brilliant experience to undergo. You sit comfortably, and the bowls are struck to produce a single gentle tone that can be prolonged by the practitioner. There may be one bowl, there may be many, each with a different sound and all of differing sizes but all very powerful and pure. The bowls, singing their single pure note, are passed about 8" away from and around your body, and where there is a block in your energy, the tone of the bowl will change. The experience of the sound of these bowls and the silence that surrounds them when they stop ringing, is magic. I had a session once, and was transported by their grace and power. I did feel very strong and clear in the head afterwards. So if Joy, or any other trained practitioner offers you a go, take it and write to me to tell me how fab it was. I will believe and agree with you. However, on the Truro Cathedral plan, I will update you on any progress, and look forward to Joy doing some workshops for A Graceful Death if it comes to Cornwall. I have to leave St Ives tomorrow morning. I will go home via Lizzie in Dorset, and on to stay with Fern somewhere else (I haven't actually checked where she lives yet), and then will land back in Bognor Regis on Saturday night. I came here to be alone, but what that really meant was I came here to gather my thoughts and to talk to as many excellent people as I could. Without housework, without family stuff, without responsibility. I am rested, inspired, hoarse, fat (Jane feeds me a lot of treats) (I eat them all), and I feel normal. I must remember to do this again, it is one of those things we all need to, do but most of us don't. 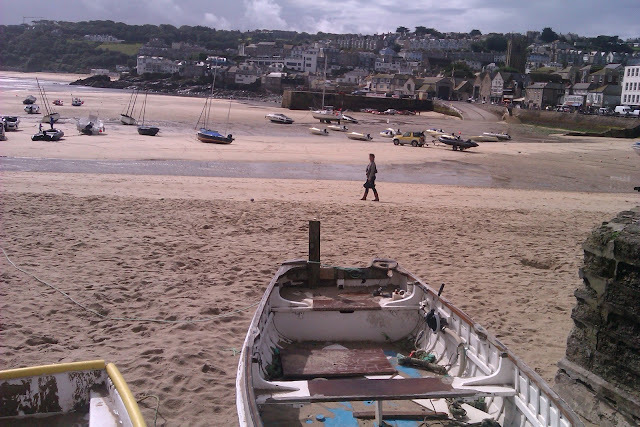 I must have Go to St Ives tattooed onto my forehead, so that I am reminded not to let it pass by when I need it again. Jane has given me so much kindness, support and peace, that I feel renewed, happy and full of admiration for her. So, thank you Jane, I hope Bognor will one day revive you. I will have to buckle down too next week. 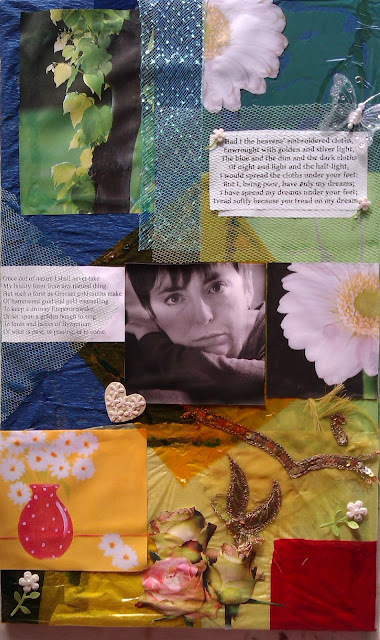 My next exhibition of A Graceful Death is at an event for LOROS Education in Northampton, at the end of October, called Spirit of Caring - Spirituality and Well-being in End of Life Care. I will be speaking at that event, and showing the exhibition. And it will showcase the two new paintings that I am doing now for AGD, of Caroline Soar and Winne from Woodleigh Care Home in Notts. I will also have a rather snappy and wonderful essay on death by my dear friend, the author Olivia Fane. Olivia is not sure whether AGD is ready for her, but I can assure her, even if they are not ready for her, they will be entertained. Crack on, Olivia, I said, crack on. We can handle it. Temporarily. I will be back. I may start to cultivate meltdowns so that I have to come back here and get fed chocolates on a memory foam bed, and take buses to Penzance to talk to Joy, go to Dorset to see Felicity in her orchard and Lizzie in her cottage, and Fern in her home, somewhere, in the South, all will be clear when I find her address. 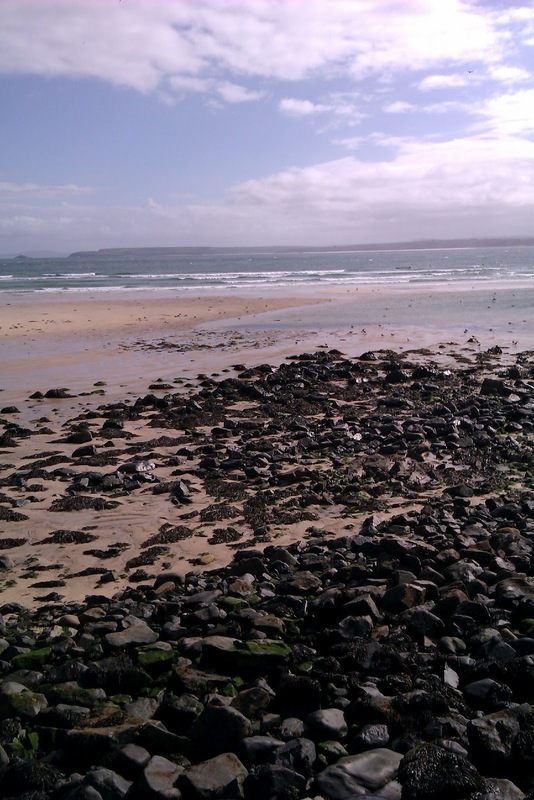 This is what Cornwall is to me, rocks and pebbles on the beach and no one for miles around. I am but a pebble on the beach of life and so on. How Are You Feeling? Aha. I have just spoken to Photographer Extraordinaire, Eileen Rafferty http://www.eileen-rafferty.com, and we have both agreed that we are going mad. We are not sure if it is the menopause, but we are quite relieved to find that we are not alone. On the one hand, it is a relief that someone else is suffering in the same way, and on the other hand, it is alarming because it may be catching. How are you feeling? Aha. However. The Summer holidays are nearly over, and soon there will be a dearth of people in my house. I am delighted to share my home with all who live here, but there comes a time in any busy home when the boss, me, needs everyone to take a long holiday. Here is my household. No 1 Son. Waiting to go back to college and spending time watching instructive, educational documentaries on telly on the sofa. He has plans to take over the world. After last night's documentary on Ancient Rome, he thinks Nero was misunderstood. No 2 Son. Waiting to go back to school and spending most days asleep and most nights awake. Has joined a gym and is training himself for future cage fights. After your GCSEs, I tell him. Lodger 1. A hard working Polish fellow who works nights. He is so well brought up and so well behaved I am grateful he stays. Lodger 2. A polite and interesting young man who is interested in astronomy and skate boarding. He always checks if I need anything before popping to the shops and I think that is very good manners. I never tell him to bring me back a bucket load of chocolate and Victoria sponge because I think he may move out. One day I will. He will be strong by then. Reg. The man cat belonging to Lodger 2. Reg really is a mystery. He is small, sleek and black. We all think he is an Egyptian God. I have decluttered my studio! It is bigger now, without the boxes and papers and pieces of ribbon. I did this knowing that it was an outward expression of a very full mind, and I was hoping that by chucking away all sorts of rubbish, I would, in my head, undergo a similar experience as if by magic. I am very pleased I did this, and while I was about it, I decluttered a fraction of my house. Under the stairs, in my wardrobe, and in the telly room, there is peace and harmony. Forgive how it just cuts off, I think you get the picture. Soul Midwives are a very wide ranging group of people, living and working all over the UK and beyond. We had a useful and encouraging meeting a few months ago, where we made contact with each other and talked through things that we find difficult. It was such a positive meeting that we decided to meet every few months to talk over our Soul Midwifery, and to learn from and support each other. So, on the 11 September I am hosting the next Soul Midwife meeting here, in my house in Bognor Regis, from midday to 3pm. If you are a Soul Midwife, please come along. Email me on antonia.rolls1@btinternet.com. Two days later, I am going to do some further training with Hermoine Elliot's foundation, Living Well Dying Well - http://www.livingwelldyingwell.net/ in Lewes, Sussex. I met Hermoine a few years ago, and liked her very much. Hermoine trains Soul Midwives as Doulas for the Dying, and has very much the same ethos as the lovely Felicity Warner who trains Soul Midwives http://www.soulmidwives.co.uk/. Living Well Dying Well is one of the sponsors for the Kicking the Bucket festival in Oxford, in which I am taking part. Liz Rothschild organiser and brains behind it, has put together a month long festival of discussions, arts, performance, information and much more, on end of life issues from 15 October to 2 November - http://www.kickingthebucket.co.uk. I will be on a discussion panel on 27 October, after a performance of Nell Dunn's play Home Death. Any more work despite growing instability up top? Why yes! There is! I am waiting to hear back from the Scottish organisation http://www.goodlifedeathgrief.org.uk/. I may, funds permitting, take the A Graceful Death exhibition plus workshops up to their Annual Event in Edinburgh. I do hope they say yes, I would love to meet them and to hear of all the good work that they do. It is an awful long way to take an exhibition, Bognor to Edinbugh and back, for one day, so I will have to see if they can cope with the millions of pounds it takes. Fingers crossed. Well if you insist. The Life Board Workshops are now up and running. 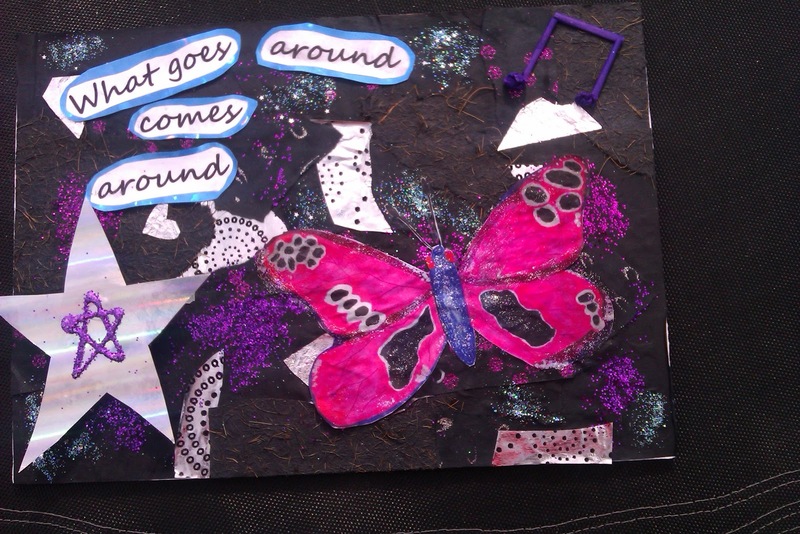 You may remember that to create a Life Board, you sit down with me and a huge table full of different papers, images, glitter, words, stick on jewels and butterflies and fancy things, paint, hearts and so on. I give you a board, and you start to create, on the board, despite feeling that you have no idea where to start and what to do, a visual representation of who you are and what you are feeling right now. Mostly, by the end of it, you are amazed by how lovely your board is and that actually, you are a very nice person with much to celebrate. You get lost in the creating of this Life Board, and feel clearer after having done it. It explains something of your self to you. So far, I have not had anyone do a Life Board and then leave in tears, shocked at how horrible they are and what a dreadful mess their Life Board has shown them to be. I did have a lady who started her life board by painting it all black. She is recently bereaved, and I thought Gosh. Where do we go from here? She ended up with a glorious silver and black, playful and clever Life Board. Here it is, to show you. the silver star on the bottom left was attached on a sort of paper spring so it leapt out at you and waved about. Workshops last 3 hours. They run in the mornings 9am to midday, or afternoons from 2pm to 5pm. They are run from my house in Bognor Regis. Cost - £30.00 per person. I have everything here, but if you want to bring photos you want to cut up and use, or poetry, bring them. Otherwise I can find poetry on the internet while you are here and print it out for you to use. If you need me to come to you with the Life Board materials, I will do that with pleasure. I will ask you to pay the travel costs on top of the £30 per person. I am going to St Ives for a few days to stay with an old school friend and fellow fairy, Jane. I know Jane will cure me, she had all the facilities to do so. I am leaving early next week in a cloud of furious fairy dust, and won't come home till I am normal. Here, to start us all off, is an Angel in her bath. When I asked Neill to do it for me, I wanted the minimum of fuss and so, this is what he has done. I would appreciate feedback, which you can do on antonia.rolls1@btinternet.com. I think that is the website covered. I am carefully not leading you and in a court of law, I would be said to be Impartial. Watching Russell Brand's TV programme last night on drug addiction, I wondered not only at his worthiness, but the worthiness of all the people in the programme. I was struck with how some people are publicly worthy, and some are not. Are they all still worthy? I expect so. And then, I thought, am I worthy? Are the people I know worthy and if they are, what are they worthy for? Russell Brand was definitely worthy last night. He produced a programme supporting his views on total abstinence for the treatment of drug users. He was passionate and visual and famous and as a reformed (but not cured, one day at a time, he said) drug addict, he knew exactly what he was talking about. We were briefly introduced to Chip Somers, the Chief Executive of Focus21, a charity that puts drug users through the total abstinence programme, we briefly met Chief Superintendent Graham Bartlett Divisional Commander of Brighton and Hove, and also briefly, we met Mike Pattinson of CRI, a charity aimed at rehabilitating drug users in Brighton. None of these fellows were visual and famous, but they were passionate. Their focus was amongst the dirt, danger and thanklessness of addiction. I was struck by the worthiness of Chip, Graham and Mike. Goodness me, they began and run charities dealing with drug addicts! Chip was a drug addict and now he spends his time getting on with running his charity to help hundreds of other drug addicts, having created and organised it from the bottom up. And then running it so that it works. How blinking difficult must that have been? How on earth did he do it? He was a drug addict for, did he say, 27 years? He has now a clinic, a system, a philosophy and lots and lots of dreadful druggy clients who he will, if they let him, help. He doesn't seem to be motivated by fame or fortune. He is motivated by something that isn't about what he looks like, nor what is said about him, he just gets on with the job. Same with Graham who as a police officer, locks up druggies. He didn't think that helped, and is involved with Mike who runs another very community based and humanitarian charity aiming to rehabilitate drug users. And succeeding. They both want to help, and so they do help. They do Big Worthiness. So do other people who run charities to help, people who go out of their way to make a difference. There is big worthiness in the hospice and Age UK where I volunteer. Lots of it. All that worthiness chugging along, and no one is famous for it. Russell Brand is famous, Chip, Graham and Mike are not. Nor are lots of other people doing worthy things. I love how they do the hard stuff though. I was terribly impressed by the dedication to making a difference. Russell? He is also addicted, I think, to himself, but if he does make a difference for the good, then Fab. Have a Worthiness Badge and wear it with pride. And then I thought about little worthiness. Do little acts of worthiness have to be planned? Can you do them on a kind of running tab? For your act to be worthy, it has to be of worth. Otherwise it is not worthy, and if it is the opposite and harmful, then it is unworthy. Am I worthy? Does my work, my life, do my actions offer worth? I thought, I hope so. Those I work with and for, and all of my friends, we try to be worthy. But we have to work at it and keep paying attention. We all want to make a difference, and we have to remember that in order to make a difference, the focus is not upon us, it is upon the people we are working with. That is quite hard because I would love for a few of the Sussex Beacons to be lit on the Sussex Downs every time I am really worthy, and for people to say to each other, there go the Sussex Beacons. That Antonia Rolls has been awfully worthy again. Time for another statue in another Sussex town square, bless her heart. A year ago, thanks to my dear other half, Alan, whose first degree came from Sheffield University, the University and I agreed to do an A Graceful Death exhibition with attendant seminars, workshops, talks and stuff from Sheffield University on the end of life. We thought November 2012 was a good time to do it, but as the time approaches, we have all begun to mumble into our cups of tea and shuffle about saying ooh well, I can ask so and so what they think, and, run it by me again? So, armed with passion and worthiness, stoked and inspired by discussions with dear friends trained in the art of kicking me gently and lovingly up the bum, I suggested to the University that we combine forces for the Dying Matters Awareness week in May 2013 instead of this November 2012. It would mean working with Sheffield University and all of the faculties and academics interested in end of life matters. So far, the University has said they like the idea, and will talk more together, and get back to me. In the meantime, I will continue with the two paintings I am doing for the exhibition, and the new essay I have on death from the remarkable, brilliant and eccentric author Olivia Fane. So when Sheffield University call me to say, we have hired the London Philharmonic Orchestra to play at your opening night, I will say I too have been busy! You now have not 45 items to display, but 48! A Graceful Death, like Topsy, has grown! Bring it on, Sheffield University, bring it on. I did my first introduction in April. Fern said I should only practice on myself and other family and friends, don't do strangers and those you don't know well. Reiki is a form of healing developed in Japan in 1922; the healing energy comes through the palms of the hands which are placed directly on the body or held just above. Fern was right! I felt brilliant after my first introduction, and thought Wow! I'm a healer! I chased 15 year old son around the house that first day, aiming to do a full body healing session on him and eventually caught him. Lie down! I said, I am going to heal you. He gave in clutching a crisp five pound note and I healed him. He slept for 2 days after that and I thought, this is brilliant. I can Reiki my household into oblivion, but then I had to go to bed too with the effort. Fern told me that I had overdone it, and to only do a bit now and again, and that in 5 months time I would be ready to do my Reiki II. The thing is, there is something to it. I Reiki'd my partner Alan's knees on the dance floor at his son's wedding so that he could dance, and it worked. In September I will do Reiki II with Fern, and then I will come up behind you and Reiki you just when you think you are safe. To end now, here is a painting of Lord and Lady Cadogan, standing in front of the huge stained glass window that they paid for to renovate, in Holy Trinity Church in Sloane Square. Here they stand with Jesus, two of their dogs and a favourite bar of chocolate by the altar. In order to fit it all in, I have re designed the altar area a bit, so don't be too confused when you go into the church and find out that it is not the same as the painting. If you are too affected by it, you can always call me and I will Reiki you into oblivion and then none of it will matter. Until next Friday then. Be good. And Worthy. The Olympics has inspired Mary the Mother of God to run the Marathon. Always one of us, she made her way round the 26.2 mile route and showed us how even very Holy people like to compete in the Olympics. Marathon Madonna, painted in 2006 and suddenly topical. Recently, the United Reform Church asked me to illustrate a book on the life of Jesus to accompany poems by Barbara Bennett. I will! I said with gusto. Make it modern, witty and colourful, they said. 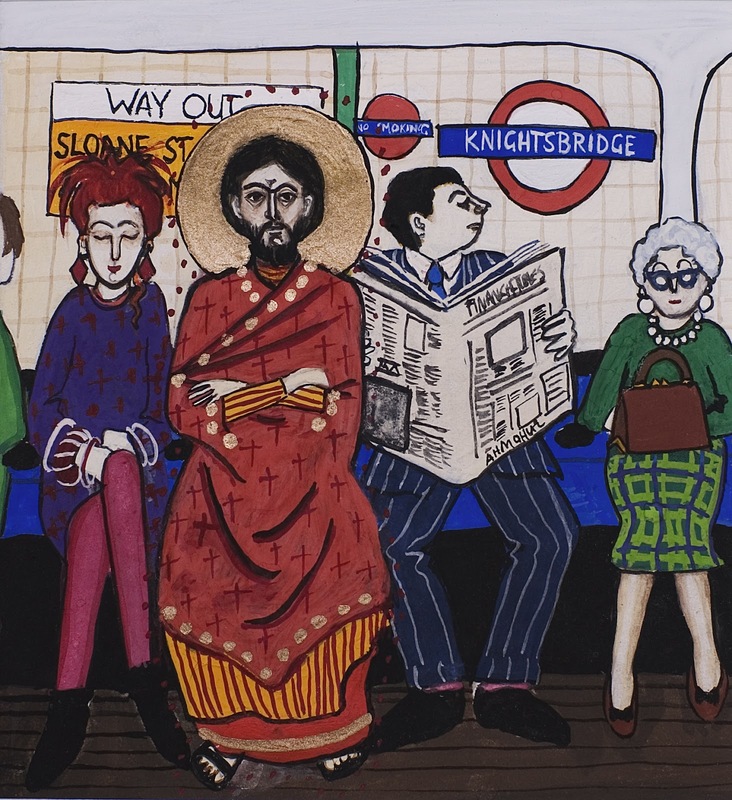 Use Jesus on the Tube they said, for inspiration. Yum yum I said. And so, I painted 31 paintings to accompany the 31 poems. The poems are about key moments in the life of Jesus, and my job was to put them in a modern setting, not stinting on the colour and fun. In order to concentrate and block out any distractions from the outside world (like having anything to do with my children) I listened to recordings of rain, thunder and storms through earphones from You Tube on the laptop. I started with 30 minute recordings and ended up with 10 hour recordings of thunder storms obviously cut and pasted together to which I became addicted and had to be wrested from the laptop by 15 Year Old Son at midnight. No, no, I cried, leave me, I am in the Rain Forest and I have 4 more hours of drenching rain and splashy sounds to go, I must do Jesus and he must be witty and if you stop me now, the world will end. Mother, said 15 Year Old Son, get a grip and go to bed. You are dribbling and those 10 hour recordings will still be there in the morning. It is past midnight and Jesus never intended for you to go mad. 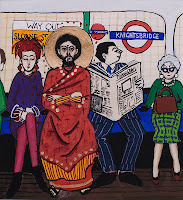 The Jesus on the Tube painting on which the 31 Jesus paintings were based. And so, with the help of You Tube, rain noises, Youngest Son and Heaven, the book is below. My dear dear old friend from childhood, Marion Magrath, died dramatically suddenly as I was painting about painting number 5. From then on, in each painting there are the initials M M somewhere near Jesus, as a tribute to a beautiful friend and lady. I was asked to make it more ethnically diverse and so in one of the paintings, there is an Eskimo in the temple with Jesus. 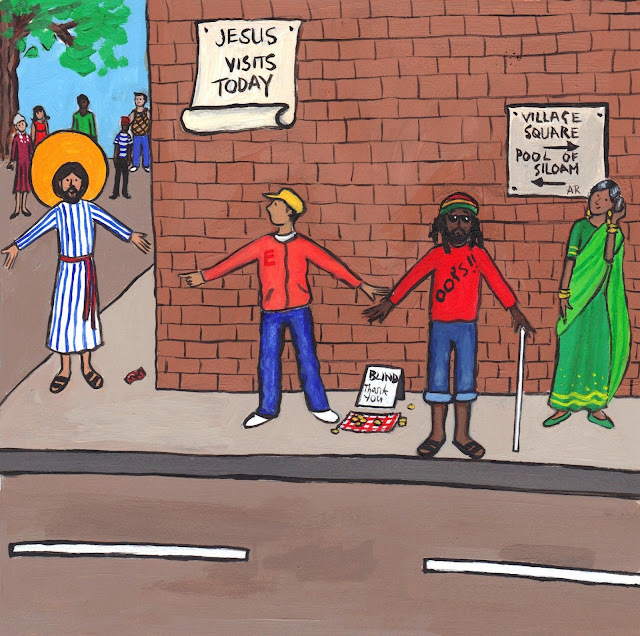 "The Blind Man" is a Rastafarian who wears a teeshirt with Ooops on it because he keeps bumping into things. Next to Jesus feet is a sweet wrapper with MM on it. Jesus heals the old lady bent double, in the temple, and breaks the No Healing On The Sabbath rules. M M is on the trousers of the lady on the left. An Eskimo looks on. The portrait of my friend Sam's son, Solomon, is done and ready. Solomon is playing his guitar and has a halo and golden patterns that I lifted from old Russian and Greek icons, on his clothes. Jolly good, I really enjoyed painting this. He really is a very nice fellow. 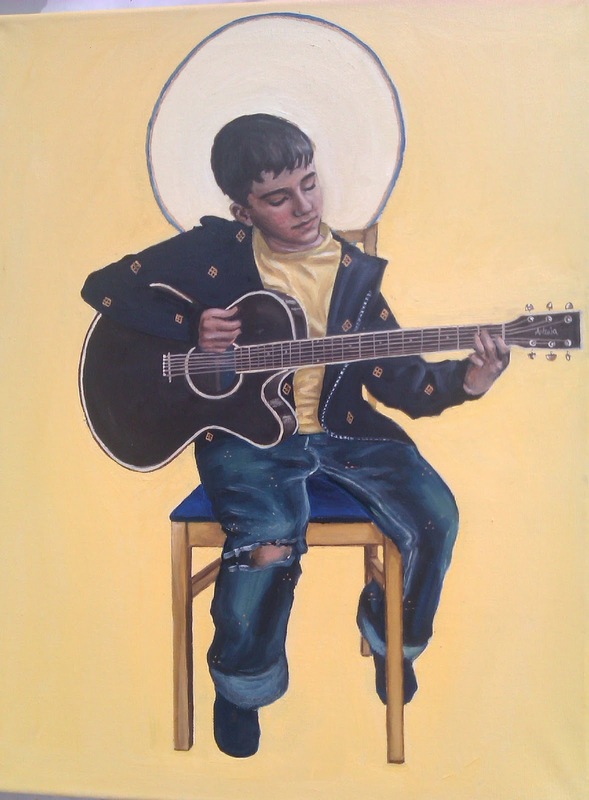 Solomon playing his guitar, oil on canvas, 14"x18"
This week, I have signed up to volunteer for Age Concern. I will learn the ropes on Thursday, and will be introduced to some old folk who have become isolated for one reason or another, and will visit them weekly. I am looking forward to this, I see so many old people in the hospice who are at the top end of the care system. To be admitted to a Hospice means that you are cared for for each moment you live, until you die. The older people that come to the Hospice are happy to be there, and so surprised that they merit such attention and care. I imagine that for every person that comes in for end of life care, there are countless others who struggle on alone into the final stretch of their lives. By becoming a befriend-er with Age Concern, I will only see the tip of the iceberg. It will be like that story doing the rounds, of hundreds of starfish being washed up onto the beach, and a little girl flinging them back one at a time. When someone told her she was mad to do that, nothing she could do would make a difference, she picked one up and threw it back into the sea saying that it will make a difference to that one. Sometimes, the hardest thing to do is the simple thing. We think, in order to be effective, we must do something big, something grand, something large enough to be noticed. We think, this grand thing that we have to do, is beyond us. We aren't trained enough, we aren't experienced enough, we don't know what to do, so we won't do anything. The most simple thing is to make human contact. We can all do this, and we take it for granted, we get so much of it ourselves that we discount it. But if you don't have it, if you are without human contact, you become smaller and smaller until you feel you have disappeared. As I pass amongst the people in my world, the people I paint for A Graceful Death, the families and the patients in the hospice, even the people coming to the exhibitions and the events I speak at with the A Graceful Death, I think that the kindest thing anyone like you and I can do, for anyone else, is to give them the time of day. Let the medical staff do the doctoring stuff. Let the therapists do the therapy stuff, let the counsellors do the counselling stuff; we can do the human contact thing. So doing volunteering with Age Concern, within their framework, will mean that I commit to making human contact with someone for whom it is a luxury. Once, just after Steve died, I went to Tesco's to shop and as I was waiting to unload my trolly onto the conveyor belt to pay, I felt myself slipping away from reality and onto the the conveyor belt, with such terrible sadness and tears, I felt I was leaving my body. I think the people behind me alerted the staff and a lady came over to me and held me up, and said something kind, someone else brought my trolley, and I was taken to sit down. Someone put their arms round me and I must have said something about Steve, and after a while, the nice Tesco lady had to go and told me she would send someone to sit with me. I was feeling a little better by then, which was probably a good thing, because the poor kid who was sent to sit with me was about 16 and obviously only just started working for Tesco. He was propelled over to sit with me, and I remember his startled face as he sat down next to me, my face red, my eyes puffy and my nose running, and he said, I don't know what to do! The unspoken part of the sentence was, eeeek! Madwoman! Well, he sat next to me, and asked me what was wrong, and I said, Steve has just died, and my heart is broken. This lad said, Oh, I don't know what that is like, but I am very sorry. I am only 16. And he sat next to me in silence, looking at his hands, wondering what the hell to do, as if he had to make it OK for me. And me? I liked this fellow. He didn't go away, he stayed there, and he just gave me his time, and though he didn't think he was doing anything, he made me feel much better. I felt sorry for him. When I told him I was OK now, and that by sitting with me like he had done, even though he was afraid, he had made a huge difference, he looked quite startled, and then, a lovely smile appeared on his face. He looked so pleased with himself and gave me a hug and left. Simple time, simple honest time. I would not recognise that fellow again, but I imagine he recognised me and dived into the baked beans every time I came into shop after that, for at least six months. In case I broke down again and made a beeline for him. Only you can help me, he would imagine me saying, come out from the baked beans and let me cry all over you. But of course, it never happened and wouldn't it be nice if he was able to help someone else who was upset after that? The nice Tesco lady who held me up and hugged me, well, I see her all the time and thank her often and fully because she really is an Angel. The new website will be ready on Friday. It is possible that Neill Blume will launch it and then all weekend afterwards we will be tweaking it and fiddling with it to make it the all singing, all dancing, life changing experience you have been led to believe it could be. Or it may just launch, like a rocket from NASA, and fulfill all your dreams, covering you in stardust as it goes. I must add here that I am a realist, and that the website will not cause nations to love each other nor cure cancer, but it will tell you what I do and that will have to do. Oh. And Finally - on Friday as the website tiptoes into the world, I will be at the Olympics. My cousin and his wife are taking me and my Daughter to see the rhythmic gymnastics and to celebrate, I will be wearing my best leotard and ribbons. Jealous? Thought so. Stop Press - the website won't be ready till the 17 August. So sorry to make you wait another week, what with the Olympics ending and life returning to normal, this must be hard to take. However, it will be worth it and soon, you will be able to click on the new website day and night and feel good about life again. Antonia.